St Bartholomew's church is unusual for several reasons, which are all to varying degrees apparent to the casual observer. Firstly, its setting. It stands with Victorian terraced houses all around. Apart from a small Methodist church a block away, there are no other significant buildings. 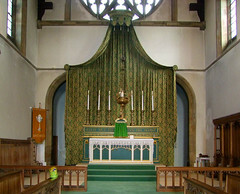 It is a very domestic setting that lends the church a high degree of grandeur. This is Rose Hill, a Victorian railway suburb. Derby Road railway station lies just 100m away up Rose Hill Road. 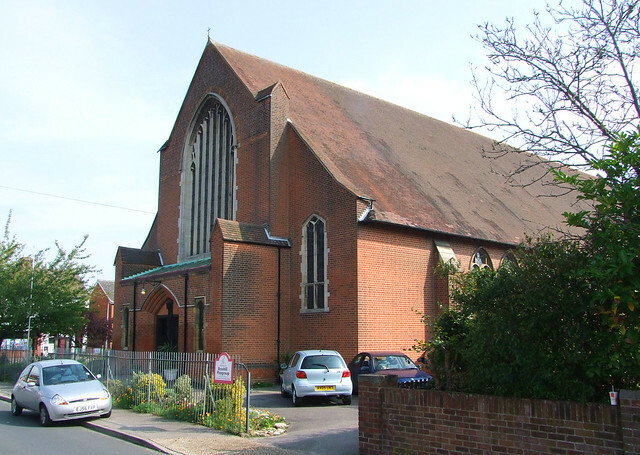 The church is slightly later in date than many of the houses, consecrated in 1895 and completed in 1907. The architect was Charles Spooner, who seems to have had an Italian hilltop village in mind, rather than anything from this side of the Alps. 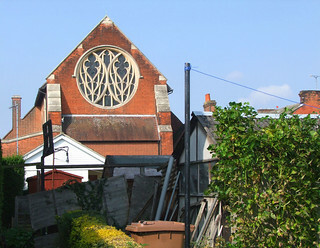 The great flamboyante east window of this fine building overlooks vegetable plots and garden sheds, just as he intended it should. The red-brick exterior was planned to be offset by a tower, but this was never built. You can see where it would have been, to the north west. A lawn is there now. 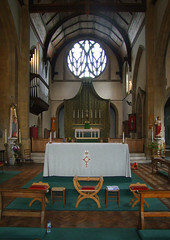 St Bartholomew was Charles Spooner's first church. He built it for his aunt Anna Spooner, who had been born Anna Cobbold. She came from a branch of the famous Ipswich family which had provided a number of Suffolk High Churchmen, the most famous of whom was Richard Cobbold, rector of Wortham and author of Margaret Catchpole, among other books. 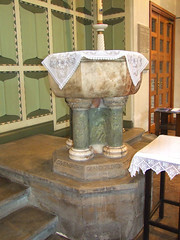 She was married to Edward Spooner, rector of Hadleigh, and her nephew George Cobbold was the first vicar of St Bartholomew, which seems to have been intended from the start. 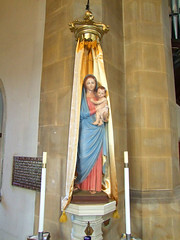 The church was provided as Ipswich's first purpose-built, thorough-going Anglo-Catholic church, a tradition it has maintained to a degree up until today. You step into an interior which is now quite unlike any other Suffolk church. This great space is alive with colour and light. Altars and shrines are all around, but there is no sense of clutter, partly because of the apparent squareness of the nave, but mainly because your eyes are drawn eastward to the sanctuary and great east window. 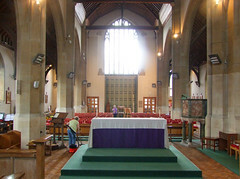 The hanging behind the altar, by Morris and Co, lifts the eyes into the gloom of the roof space, which is then shot through with light from above. 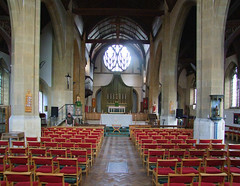 The simplicity of the rows of chairs, and the austere beauty of the high arcades, contribute to an experience unique in Suffolk, otherwise the most singularly Low Church of English counties. Looking west, the elevation is flooded with light from the great seven-light window. Spooner's plans envisaded twelve-lights, which would perhaps have detracted somewhat from the east end, especially at evensong on a sunny evening. And yet, St Bartholomew might have been even more beautiful than it is. In the 1920s, a vast scheme of glass by the great Christopher Whall was planned, but it was never executed. It certainly would have made this a church of national significance. 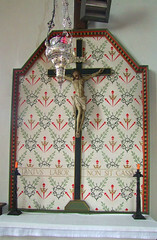 A war memorial altar in the north aisle bears a simple crucifix. This church was brand new when the War that would change the Church of England forever began, taking away boys from the humble terraced streets all around. 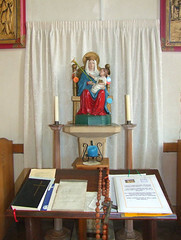 Across the church is an altar to Our Lady of Walsingham, one of only two in an Anglican church in Ipswich. 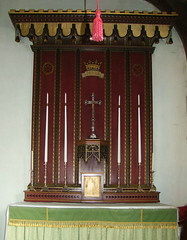 A new altar sits in the nave, but still the great high altar with its six silver candlesticks remains, a triumphant symbol of the heady days of the Catholic revival. 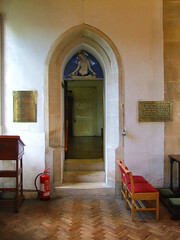 A cool little chapel in memory of George Cobbold, designed by Munro Cautley, sits beside the sanctuary. 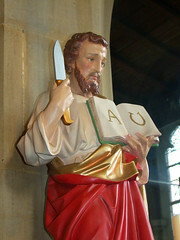 It is probably his most successful work in a church which was not his own. And all around, everything is devotional and striking. In the 1920s, many Anglican churches were like this, especially in urban areas, but that is all now finished with, especially in Suffolk. St Bart's now sits high and dry, and attracts a congregation from all over Ipswich.